The franchise co-founder talks about handling startup red tape, getting the word out and the trouble with hiring friends. 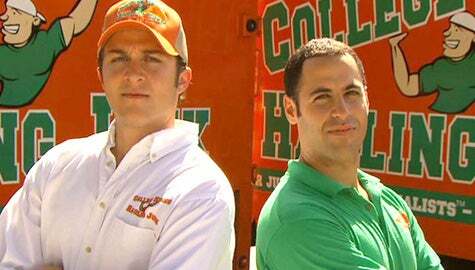 Founders of College Hunks Hauling Junk: Omar Soliman and Nick Friedman. Business: Franchisor of junk removal, moving and donation pick-up business. Nick Friedman was a senior at Pomona College when he and a couple of buddies started using a cargo van for junk removal, light moving and deliveries to earn some extra cash during the summer. When he graduated, he got a job as a research analyst. Meanwhile, Friedman worked on the business on the weekends and evenings. Three months into his cubicle life, he emailed his friend Omar Soliman, and they decided that it was time to launch College Hunks Hauling Junk full-scale. What started with one truck now includes 33 franchises, a fleet of more than 50 trucks, 30 corporate employees and 100 employees system-wide. Challenge No. 1: Finding out what permits, licenses and other required documents were needed to start a junk-hauling business. We didn't expect hauling junk to become a real business, so we didn't even think about permits or licenses. Unfortunately, we learned the hard way when local authorities pulled us over to check our documentation for hauling, threatened us with arrests and hit us with fines for not having the right paperwork. That's when we decided to take what we were doing a little more seriously. We took our idea to our professor, who did his best to guide us to the right local township offices to get us started. Why: This requires a lot of research and planning ahead, but it can also cause you to get stuck if you don't power through it instead of just pulling the trigger and getting started. At first we got stuck for weeks trying to figure out what paperwork we needed and making sure to get every license and permit. It all took so much time and energy. Solution: We spoke with other local businesses about how they handled the permits and licensing in the beginning. They gave us an inside look at how they began their business, and some even showed us their original business plans. They told us not to get bogged down in details or over-analyze what we needed to get started. Some said that we shouldn't even bother writing a business plan. They suggested we just take the plunge first and then figure out what we needed. We also called our local town hall and spoke with the township officials who handle local businesses. Eventually, we decided we could spend our entire lifetime making sure we had all our ducks in a row. We have adopted the mantra "Ready, Fire, Aim." The idea is that if you launch the business, you can always go back and tweak some of the administrative aspects. We've been hit with a few minor fines and warnings since launching, but we chalk those up to expenses that are worth spending rather than wasting valuable time on administrative details just to save a few hundred bucks. As long as it's not a business-threatening issue like filing taxes or proper licensing, then it's not worth driving yourself crazy trying to line everything up perfectly -- it will never be perfect. Challenge No. 2: Finding ways to advertise without going over budget was a challenge. We budgeted about $1,500 per month but probably ended up spending nearly three times that amount, so we had to revamp our plan to fit the new budget. Why: There are a lot of different ways to go about advertising and a wide range of pricing options. Since we were a new company, everyone was trying to sell us, and we bought because it all sounded so good. Solution: Every business should have enough cash reserves to spend money on advertising because advertising is extremely important. There is nothing wrong with spending money on advertising, but if you don't stick to your budget, it can stretch you very thin. We started out with little obvious things, like making our own signs to hang on telephone poles. We also put a small ad in the newspaper and made sure to ask our clients where they heard about us. If an idea worked once, there was a good chance it would work a second time. We took advantage of low-cost grass-roots guerrilla marketing like parking our truck in visible locations, making cold calls to potential commercial clients and calling on everyone in our inner circle for referrals. Challenge No. 3: We started our business by hiring our friends because we had never hired or managed anyone before. We were more comfortable working with friends, so we were friends before we were employers. Why: Being the boss instead of a friend is harder than you think when you are used to being a co-worker and not an authority figure. Employees were taking advantage of our personal relationship -- sleeping in, calling in sick and not taking the job seriously. This caused the business to suffer because it resulted in an unprofessional dynamic that affected the customer experience. Solution: This taught us our first management lesson. We needed real systems in place that would enable us to hire outside our circle of friends to have them fill a position in the business, rather than relying on the familiarity of personal relationships. I had to find the proper balance between friend and boss. Establishing systems of role definitions and accountability are key to making this happen. I learned not to let employees get away with improper behavior or not getting work done. There is no problem with having a good working relationship with employees, but it's essential to be the boss first. The success of your business may count on it.